Not a Bird or a Plane?-The head of the National UFO Reporting Center gives his theories about the strange sighting over Chicago’s main airport. Jan. 4, 2007 - The Federal Aviation Administration says it must have been a weird weather phenomenon, and United Airlines denies any knowledge of the case. But though it has been two months since what appeared to be an unidentified flying object (UFO) was spotted over Chicago's O'Hare International Airport, the incident is still raising questions about what exactly was seen and whether the authorities are trying to downplay it. As many as a dozen United Airlines employees swear the mysterious object they saw on Nov. 7 was real—hovering for several minutes above the United Airlines terminal and then shooting up through the clouds so powerfully that it left an eerie hole in overcast skies. "At first we laughed to each other" when the report came over the radio, a witness told the National UFO Reporting Center, a Seattle-based nonprofit that maintains a UFO hotline and is listed as a resource in the FAA's official Aeronautical Information Manual. But then I saw the "dark gray, hazy, round object" and seconds later "there was an almost perfect circle in the cloud layer where the craft had been." His statement is published on the Web site of the National UFO Reporting Center, which says its policy is to protect the anonymity of its witnesses. So was it a UFO? A secret military aircraft? And why did it take two months for the details to come out? It may sound like the oldest hoax in the book, but the United workers—including several pilots—who say they saw the object are reportedly upset their claims have been ignored. The FAA has said it won't be investigating the incident further, and it wasn't until this week that The Chicago Tribune broke the story, speaking to several unnamed witnesses after a tip-off from the head of the National UFO Reporting Center. Peter Davenport heads that organization, and has a lot to say about the way the incident has been handled. A self-described UFOologist, Davenport spoke with NEWSWEEK's Jessica Bennett. NEWSWEEK: Your Web site has documented more than 3,000 UFO sightings just in the last year. Is that normal? Peter Davenport: We get reports that number certainly into the thousands, and sometimes into the tens of thousands. How many of these do you believe are real, and how do you determine whether they are real? The overwhelming majority of [reports we get] are not UFOs. Many people report stars and planets and aircraft and humming birds and pelicans and Frisbees and hubcaps—there are thousands of things people can look at and not be able to identify. We rely on our experience to try to quickly identify those cases that are probably not genuine UFOs. How long have you known about this particular incident in Chicago? I found out about this on the day of the event. We got multiple communications. We released the information about the 12th or 13th of November, put it on our homepage, and, frankly, I was flabbergasted that nobody was paying attention. Do you think there has been an effort to downplay it? My strong suspicion is that this case showed up on the 8th of November—the day after it happened—in the intelligence briefing document that the president apparently reads every morning. Are we to believe that a UFO can appear over a major U.S. airport and the American intelligence community is not informed of it? That proposition is absurd. If that's the case, why would the federal government keep those findings from the public? You've got to go directly to the government or to United Airlines [for the answer to that question]. I'm shocked by their response to this, except for the fact that we've seen this kind of response—certainly on behalf of the government—for the past 59 and a half years. What happened 59 years ago? That takes us back to the first formal sighting that caused a ripple in the press, which was June 24, 1947, here in the state of Washington. That was Mr. [Kenneth] Arnold, who saw a string of [disc]-shaped objects streaking down the Cascade Mountains [near Mount Rainier]. That was the event that gave us the term "flying saucer." Still, there are a lot of UFO skeptics out there. What do you say to them? I've been asked that question about half a dozen times before. Skeptics are free to think whatever they wish. All I do is release the information—hopefully, accurate information—and people may read it or consume it anyway they wish. But many of these hard-boiled skeptics simply do not look at the data. They have a preconceived notion of how the universe works—what is possible, what is not possible—to the extent that they no longer have to look at data. The data are the cases that come in, the information that we're receiving on a steady basis—over the telephone, over the Internet, photographs and so on. Probably the most reliable source of data that we receive is eyewitness accounts from responsible witnesses who seem to be independent of one another. That's not true of all the people who contact us, of course. We get calls of many, many stripes. But we focus on the cases that are very well documented—as in the case of the O'Hare sighting. So you've spoken to the witnesses in this case. Yes, that's how we got the information. And you think they're credible? The witnesses [in this case] are not only responsible but they're qualified by virtue of the fact that they've worked in the aviation industry for decades—each one of them. They're familiar with aircraft, they're familiar with weather phenomena. United Airlines and the FAA have apparently taken the position that it either didn't happen, or if it did happen it was a weather aberration. Well, the written communications that I have in my possession clearly belie that position. So you obviously believe that UFOs do exist. 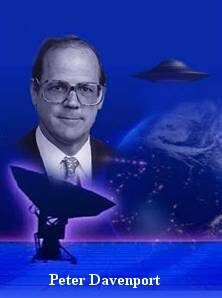 My objective is to give the American people the information that they need to have, in my opinion, in order to make a rational decision with regard to the UFO phenomenon. In a sense, I guess I'm an advocate for the notion that our planet is visited on a frequent basis by these things we call UFOs. If my theory and the theory of many other UFO investigators is correct, then the U.S. government certainly knows about this [phenomenon], and has known about it for at least six decades and is not sharing that with the American people. I believe that is wrong. How do you define a UFO, and what elements of that definition were visible in what was seen at O'Hare? From my standpoint, [UFOs] are those objects that exhibit characteristics that strongly suggest that they, almost without a doubt, are not of man's manufacture. That statement I think is supported by the fact that these UFO sightings appear to go back hundreds or thousands of years. We have reports on our Web site from the 1930s, from the 1890s, from 1860, and I have two written reports on file—one from China in the 12th century A.D. and a report from ancient Egypt from 1770 B.C. So could that be the U.S. Air Force experimenting with aircraft? Clearly not. In the case of this object at O'Hare, [the object sighted] seemed to accelerate so fast and disappear so fast that people's eyes were unable to follow it, and they didn't know which way it had gone. Now, could that be of man's manufacture? I doubt it. Why is there so little debate on this subject? People think that UFOs are strange. But in my opinion, the reaction of the American press to the UFO phenomenon is stranger still. They're not interested in what I consider to be the greatest scientific question of man's existence of all times: are we alone in this galaxy or are we not? From my vantage point, the clear answer to that is that we're not. And it appears that these objects visit our planet on a regular basis.